The ecueditor.com 2.2 is now latest tested version. First untested version published as Ecueditor.com version 2.3 for seeing the boost control user interface alive. Is anyone else having an issue Down loading the Latest 2.3.0.25??? (Beta Version) I cant seem to get it loaded! I have Completely Removed ALL EE2 Files off my Laptop(Twice), then Tried Re-installing 2.3.0.25 But it Keeps Down loading the Same "2.2.0.24"......Help Please? Toxsick, i am having trouble loading the latest version but had not uninstalled an earlier version, nor too concerned yet, still several weeks till i have a boosted bike to play with . yep, 2.3 is almost there... This is the same issue as earlier when changing the version to new directory. Now 2.3 should be ok to download, please note that the boostfuel in that one is not yet tested. Other than boostfuel should be ok and stable. Nev version of the boostconroller initially tested on a bike on dyno and seems to work. We only controlled pressure to wastegate with adding pressure with solenoid, so no double pressure lines needed at least in this case. There was an adjustable unit to reduce to flow before the solenoid to make the flow smoother. For those of you who are considering high power over 400 dynojet rwhp or over 300 rwhp standard dyno. There may be an issue in what is the current electric system capable of delivering to coils. 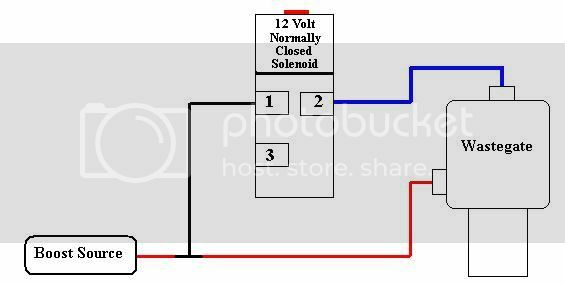 Strenghtening the +12V line and ecu grounding may help. 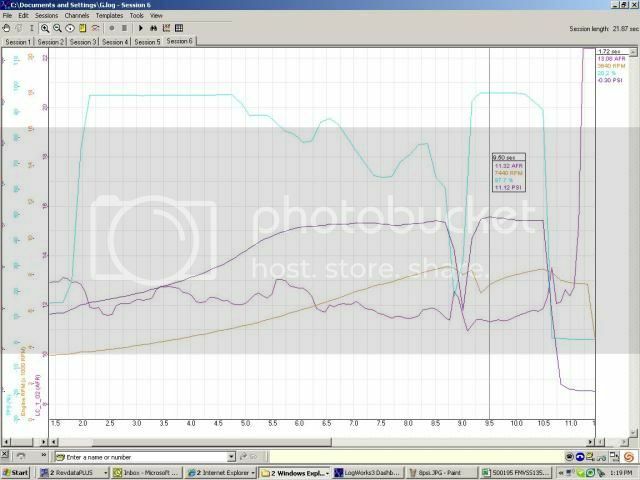 within past week 2 more bikes dyno tuned with boost fuel. More details as soon as owners agree I can post details. 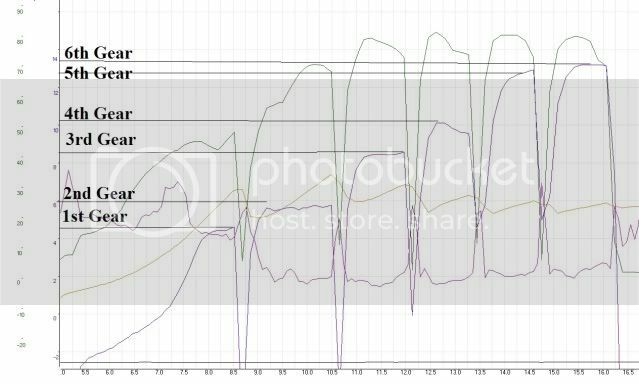 Stock motor'd bike (stock compression), dropped my basemap in and didn't tune anything i dont think and AFR looked pretty close. good deal, looks like it is working, on the second bike was the boost controled by ee2...? 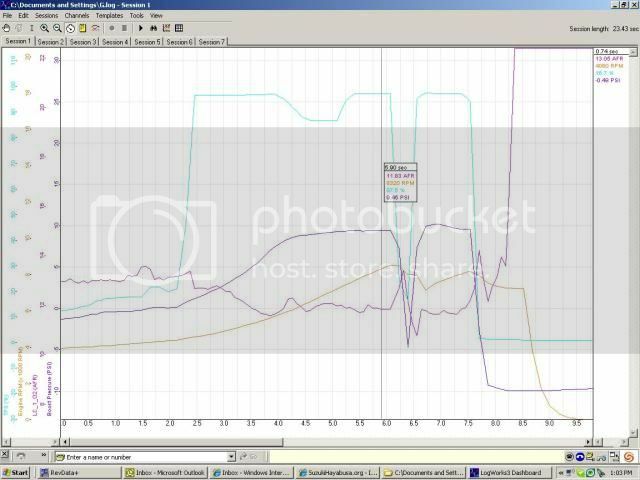 Here is 14 psi, here you can see where I have too much duty cycle programmed in (this duty cycle will make more than 14 psi of boost, but ecu is shutting solenoid control off when it hits 14 psi, then lets it become active again when boost drops below 14 psi). 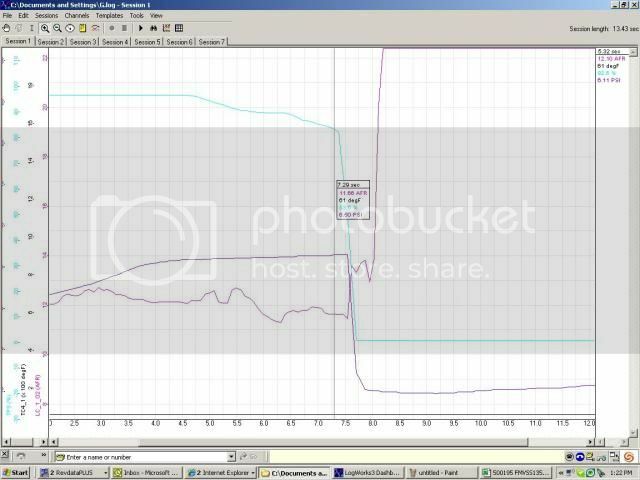 so if i want 14 psi boost smooth, i should lower the duty cycle down until its nice and smooth, or bump my max pressure up to 15 psi and then tune duty cycle more etc. gate springis 6 psi, 1st gear only 4-5 psi with so light in the throttle, but the rest of the gears working out quite nicely :) I am sure had i kept in it 100% throttle boost traces would have been much nicer, but man a stock arm is a trip LOL. umm YES, for sure :) I just need to get used to 300+ stock wheelbase'd hp in the upper gears, it pulls pretty hard, i guess the yellow bike pulls harder, but with a 6 over arm it seems so much easier haha. Petrik once again THANKS SO MUCH! X3!!!! Petrik, Don't know what we would do without you Bud! Thank You for ALL the Hard work you Put into Helping us all go Faster, with a Safer Tune! Ive got a good 500-600 miles of boost fuel riding now, and the last 300 or so with boost control active, and everything is working so well. 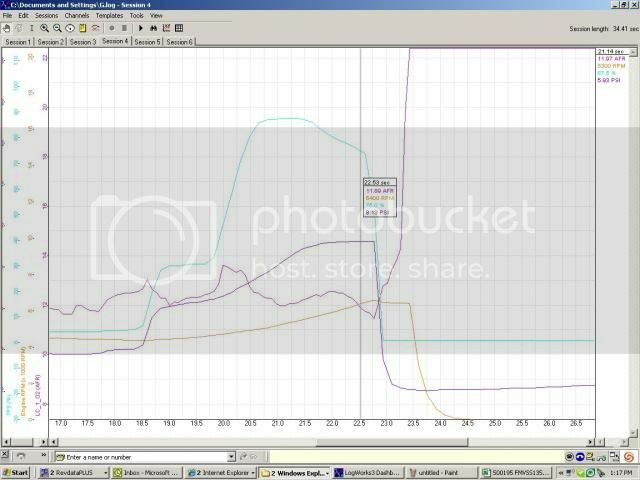 The rides I have been on have been more so testing things and datalogging, so I am doing very very little putting around, lots of top end pulls, and repeated boost applies etc, and its all working sweet. Thanks again Petrik! Last night pulled 10320 actual rpm (from datalog), which was about 11,100 ish on the tach in 6th gear, what a rush at about 13 psi of boost. I'm working on my gen II project and learning about the ECUeditor for a turbo application. 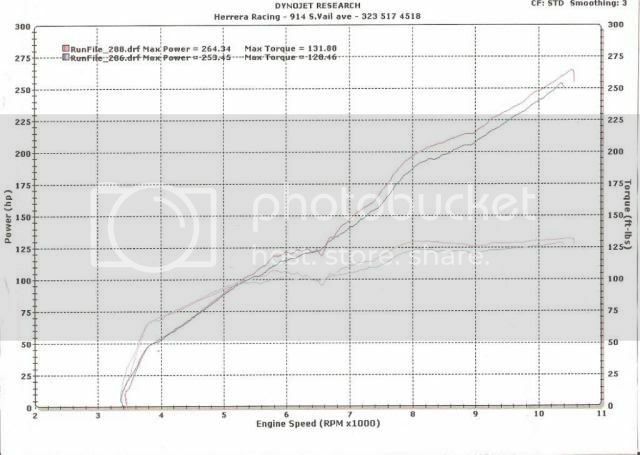 I was thinking about increasing the limiter to 12K RPM but the max RPM's are 12K in the boost fuel map. I'm not sure if I'm going to able to do this because the fuel cells interpolate. 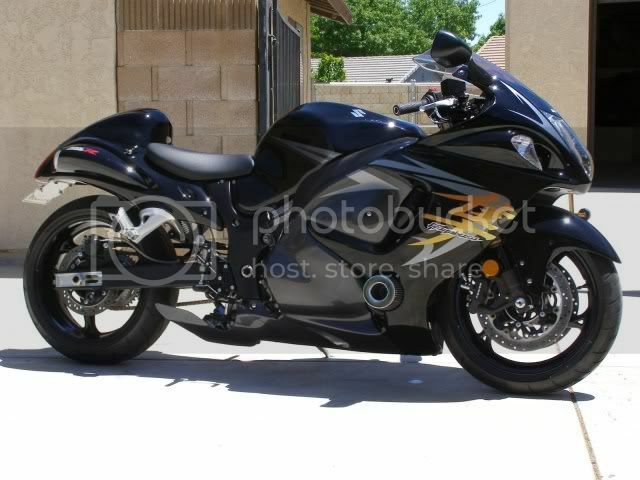 In essence, if I tune the bike up to 12K RPM I would "think" it should have fuel cells above 12K to tune with. 1. 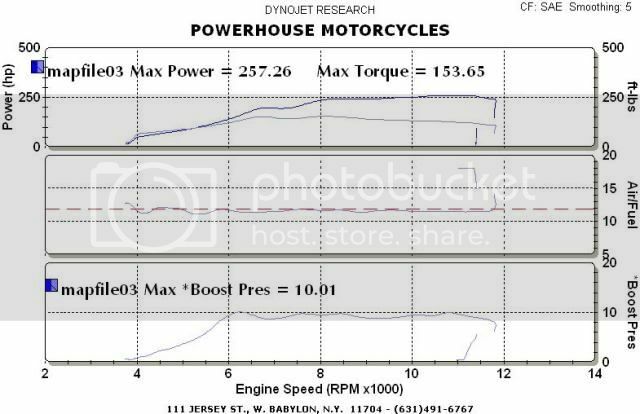 Do you think I can tune the turbo bike to 12K RPM with the current software and have a 12K RPM limiter? 2. If I can't tune it to 12K RPM can the boostfuel table program be increased to 13K RPM? If I remember correctly some of the tables run out at 12400rpm, after that the max value will be used. 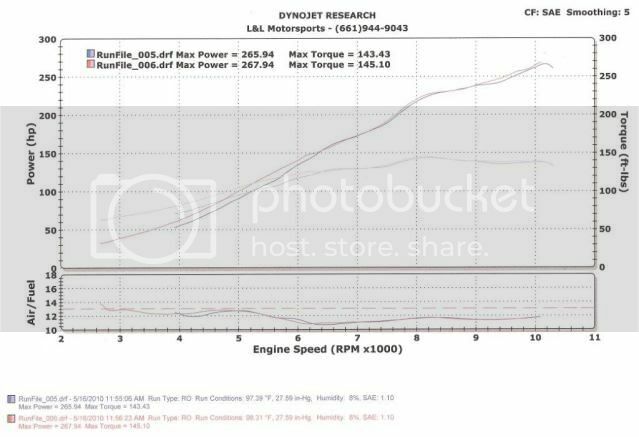 This is the reason why initially RPM limiter max was set to 12000rpm, but now increased as per users request. On turbofuel module it is fairly easy to add some more rpm rows if needed. 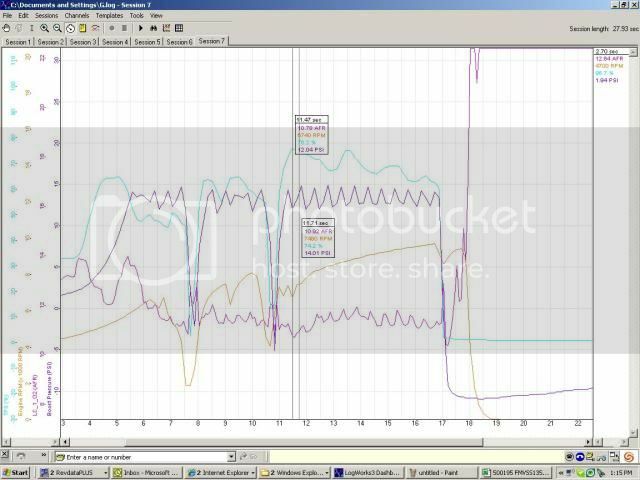 We again tuned one turbofuel bike here - and I think we are getting to a point where the software is just used, no more getting much feedback on things that need to be improved. If we could get the boostfuel tables increased to 13K I would appreciate it. 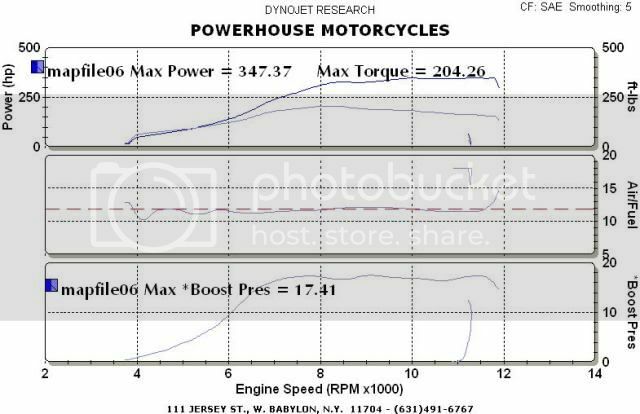 I'm not a computer guru or advanced tuner but I'll share my experiences and results tuning the 08 turbo bike if you would like. Thank you sir. so ee2 does fueling by boost???? and now for gen 1 nothing yet for contolling fuel by boost???? Does the ignition retard portion of the boost control function as intended? Any particular reason for concern ? No reason for concern. I was researching the ignition retard, and elsewhere you had noted that the functionality was there but not tested (ported from nitrous control). I was just wondering if it had been used. PetriK, What is the logic behind making the ignition retard gear based rather than manifold pressure based? Is this just a carryover from the nitrous control module? Just a carryover, as you set the max boost perngear that was easiest route to implement. Below is a table that should work for converting the Values in the Gen2 boost fueling module to be compatible with an SSI 5 bar absolute pressure sensor. Data for the suzuki to GM 3bar are based on data provided by PetriK early in this post. I have also included the proposed nominal values and high pressure value of 4.5V@60.3 psi for the SSI sensor to be used in a boost compensated fueling chart. Suggestion is to use the current 3Bar chart as is and add a few more columns, up to ~45 psi. Thanks, now all we would need to do is to change these numbers below. There is two places where a conversion is needed. The first one is for vacuum area and the second one is for boost area. If you can calculate the new numbers for this new sensor I can easily put a button to ecueditor that lets the user to select which boost sensor is used. EDIT - The examble of 0x52/0xFF *5V -> 1,61V refers to ambient pressure of 1bar in the above message where GM3bar sensor 1bar is 1,62V. // conversion for GM3bar sensor, vacuum area here the 0 bar for suzuki sensor is 0xB7 and 0bar for GM 3 bar sensor is 0x50 (if I remember corractly). Numbers are kPa values, ie. 100=1bar. PetriK, I believe this is what you are after. I am a rookie at all of this (although I have great interest). I left of the 0x as I beliefve this is implied when dealin with HEX. It has been brought to my attention that the higher levels of boost should not need to be on only 2psi increments, rather 5psi increments would be sufficient and therefore I propose the following data table be implemented as the selestable sensor ranges. This would only add 3 additional colums to the current table. Chaging the x-axis from 16 to 27 would mean that all old boost maps are not anymore compatible with this. Could we still keep the 16 point map or just acknlowedge that e.g. from version 2.6 onwards the boost map compatibility is lost. That is certainly a possibility, however there are likely a fair number of bikes that are already tuned with the current mapping resolution. Is it practical to make a sensor select radio button with one option being the map exactly as it is now for 3 bar usage and to preserve the tunes of already mapped engines, and have the 5 bar map with modified cells? Perhaps keeping the lower ranges the same as they are now in order to at least (potentially) be able to transfer some of the drivability (low boost) map data to the new map? This would be similar to the extended map option currently available to extend the map up to 31 psi. From programming perspective all constants we see on the screen will move if we add cells to the map - in practise this means maps are not compatible without some quite workly programming. A) Leave v2.5 as the last one with 16 map and introduce v2.6 onwards with e.g. 36 cell map without compatibility with v2.5. B) Continue using 16x map and just change the bar column headings. The second choise is a bit easier to implement, but not much. So this is really for you guys who use this to decide. We have some time here still for next season, so maybe you could ask this on other forums too ? Richard of RCC Turbos (Canada) has expressed interest AND has a Gen2 turbo bike that he can test the new sensor with. He has suggested that resolution at 25psi and above need only be in ~5psi increments. Other than the formulas below I think is now implemented and just waiting for this information. I will take a look to see what I can come up with. You are referring to a formula for the display in the ECU editor GUI from the values correct?